The Cotswold Canals comprise the Stroudwater Navigation and the Thames & Severn Canal. Together this 37 mile route used to link the River Severn at Framilode, to the River Thames near Lechlade, both of which are in Gloucestershire, in the United Kingdom (UK). About 6 miles of the Cotswold Canals is currently being restored, with the remainder of the route either obstructed, infilled or unnavigable. For information about lengths of the canals and numbers of locks etc. see the statistics page. The Stroud Valleys Canal Company manages the western section of the Cotswold Canals, and information for canal and towpath users can be found on their website here. The Stroudwater Navigation was constructed between 1775 and 1779, and linked Framilode, on the River Severn, with Wallbridge in Stroud. The canal was officially abandoned in 1954 by Act of Parliament. 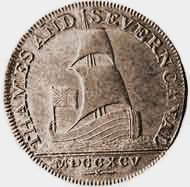 Work started on the Thames & Severn Canal in 1783 and it opened in 1789. This canal was abandoned in two phases; the 'Upper Portion' between the River Thames to just above Whitehall Bridge (including Sapperton Tunnel) in 1927; and the 'Lower Portion' from Whitehall Bridge to Wallbridge, Stroud in 1933. However the last recorded commercial boat traffic through Sapperton Tunnel was in 1911, and the Thames Head Pumping Station ceased operating in 1912. This means that the through-route had effectively been severed as early as 1911. 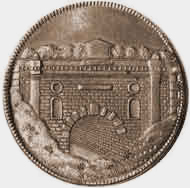 Struck in about 1795, these half-penny tokens were used to pay canal employees as there was a general shortage of coinage at that time.